Mrs Wilson on Masterpiece, broadcast in three parts from March 31st 2019. Image: PBS. Click through to access series. The three part dramatisation of Mrs Wilson starring ‘Alec’ Alexander Wilson’s granddaughter Ruth Wilson is being broadcast across North America on the PBS network in Masterpiece. See the Q and A with biographer Professor Tim Crook on the PBS online platform by clicking on this line. The much acclaimed series has also been nominated for four awards by BAFTA UK after its broadcast in Britain at the end of 2018. The US/International Edition of the biography that is the foundation of the series, The Secret Lives of a Secret Agent Second Edition, is now available in the USA at Amazon.com, Barnes and Noble online, and other online suppliers. The BAFTA nominations are for Ruth Wilson Leading Actress, Snowed In Productions and BBC One for Best Mini-Series, Keeley Hawes for Best Supporting Actress, and Konnie Daniel for Best Make Up and Hair Design. Ruth Wilson nominated for Leading Actress in UK BAFTA awards. Image: PBS Masterpiece. Click through to access series. At the same time efforts by the historian and biographer of Alexander Wilson, Professor Tim Crook, to persuade the British authorities to release more files and information have yielded some progress. The UK Security Service MI5 are now considering his request to release as much information as they can to the National Archives. He was invited to contact MI5 by British Home Office Minister Ben Wallace MP. My involvement in the project has been academic and humanitarian and I am hoping the Security Service’s enlightened policy of releasing material for historical public interest could be extended to Mr Wilson in order to assist the understanding of his surviving children two of whom are now aged 97 and 96. They and the many members of his extended family would appreciate the release of any Archives that could explain the background to events taking place more than 70 years ago and subsequently. Professor Crook has been told that the relevant department at MI5 is now considering the request. As the credits explain at the end of each episode, the series is based on a combination of a short memoir written by Ruth Wilson’s grandmother Alison (who was ‘Alec’ Alexander Wilson’s third wife) and more than 13 years of investigation and research by Professor Crook that resulted in the publication of the first edition of the Secret Lives of a Secret Agent in 2010 (Kindle edition in 2011), and more recently the second and wholly revised edition published in the UK in 2018 and the USA in 2019. 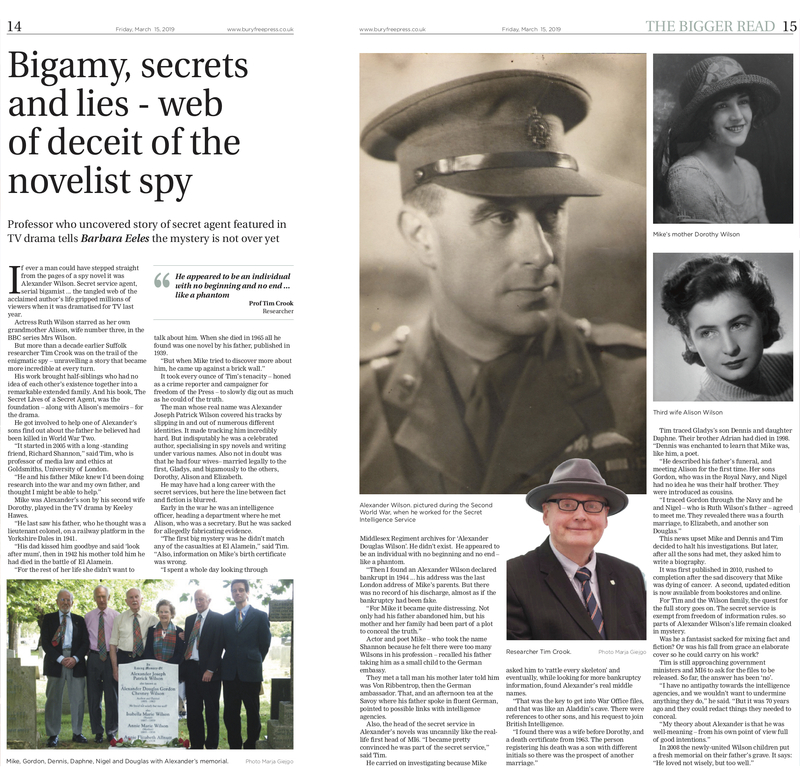 Recently Professor Crook was interviewed by feature writer Barbara Eeles for a Suffolk group of local and regional newspapers and he described how he unravelled the complex mysteries of Wilson’s extraordinary life as well as helping to bring the various families together. Feature article by Barbara Eeles of the Bury Free Press in Suffolk, England on Tim Crook’s research project for the Wilson family. Wilson’s grandson, Sam Wilson (brother of Ruth Wilson) wrote an analysis ‘Mrs Wilson: Still Searching for the Real Mr Wilson’ for the BBC to accompany the hugely popular broadcast in the UK. Visit the other pages on this website for more background information on the Alexander Wilson story, his family, the investigation, and his career and significance as an author. “Mrs. Wilson” is one of the most gripping, fascinating, and terrific Masterpiece Theater presentations. It is haunting; there are so many unanswered questions about Alexander Wilson’s life. I am so glad I had the opportunity to watch the program. Dear Susan, Many thanks for your feedback and comment. We will pass on your appreciation to the production team. Sincerely and respectfully, Tim Crook. Truly enjoyed Mrs. Wilson. It makes me wonder how many other “marriages” were like this during the war years and no one knew. I sure hope the families get the answers they need from the government. The mysteries and secrets of family histories is unnerving. Thank you Wilson family for letting us into your family for this interesting story! Dear meiz828, many thanks for your positive feedback and comment. It is very much appreciated. Sincerely and respectfully, Tim Crook. Amazing story. Hopefully, someday the “rest of the story” will be known. Did Alexander Wilson uncover a mole high up in the British secret service or government–one wonders? Dear D K Marx, Many thanks for your comment. We hope the rest of the story will come to light as well. We are continuing to politely ask for the release of any relevant files. Sincerely and respectfully, Tim Crook. I have many questions regarding Alexander’s Service as a spy….hoping the UK will release this information, his large family deserves an explanation as to whether their he was a hero or a fraud. Yet he published many spy novels under his own name-why did no one at MI6 question this? Were they not concerned that perhaps he was revealing secrets? Or was his participation so miniscule, he knew very little and therefore there were no secrets to be revealed? One question leads to another. Dear jotheodorou, Many thanks for your feedback , comments and questions. All excellent and pertinent points. We are hoping that our request for the future release of relevant government information may help us find the answers. Sincerely and respectfully, Tim Crook. Excellent series! Would love to own this, purchase his life story. Dear Mary, Many thanks for your feedback. I’ll forward your comment to the production team. Sincerely and respectfully, Tim Crook. I don’t see how he could write 24 novels in 12 years and have any time left for spy work. From the excellent series of “Mrs. Wilson” it appears that he may have been greatly shell shocked from WWI. I hope MI 5 comes through with material on him. Thank you greatly for this series. Dear Linda, Many thanks for your feedback. You make a very important point. He seemed to work extremely hard whatever he was doing. In one year he completed and had published three novels, but the average was two a year as you point out. The severe scarring, described as like shrapnel wounds across large parts of his body were verified in 1919 by the medical officer at the Oakalla Prison Farm in British Ontario. They were also confirmed by members of his family, yet they remain unexplained. We hope the Security Service/MI5 are able to assist. If they can, everyone is braced for more surprises and the unexpected. Sincerely and respectfully, Tim Crook. Over in the U.S. (via Chicago), just watched this whacky tale! Despite the duplicity, this brilliant man inspired a lot of love. The series implied, it seems, that his handlers were aware of the string of illicit marriages, plus growing brood–without intervention of the law. The scene of Michael confronting “Mrs. Wilson,” with Michael threatening an investigation, was intense! and had the feeling of most fidelity (to this viewer) in the tale. With all the publicity and clippings produced in his life by a Spy/Novelist/Prisoner, it’s a wonder how four families remained siloed–they certainly knew what address to go to once the man had died! Well brava to Ruth, et al. P.S. I found, in the encapsulations of some of Alexander’s spy novels, an extraordinary rhyming of today’s times–religious terrorism, bold female characters, and of course featuring trans-national espionage. It would be amazing to have some of Alexander’s spy novels produced in Hollywood! Please keep us posted! Dear Mazal, Many thanks for your detailed and very interesting feedback and observations. This is all very much appreciated. There was a fair amount of dramatic licence engaged in the dramatisation and the second edition of the biography offers the factual analysis and narrative so far as we have been able to establish this. We completely agree with you about the potential for producing some of his novels in Hollywood and we will certainly keep you posted. Sincerely and respectfully, Tim Crook. Greetings from Turku, Finland! Our Yle channel released Mrs. Wilson this week. We just finished watching it, and I must say it was the most moving, exciting, enchanting tv-drama I have seen! I have always enjoyed British quality tv-series, but this was unique! I also read all you wrote about your research and Wilson family. I’m deeply moved by the real history of real people, whom this productiion, wonderful team of the writer, director and actors made so alive and close! Dear Marja, Many thanks for your thoughtful, generous and detailed feedback. We are so pleased the series has been broadcast in Finland and you have been introduced to the subject. We will forward on your comments to the production team and family. Sincerely and respectfully, Tim Crook. Mazal, I believe it was “Dennis” and not “Michael” who threatened to expose the bigamy. The quotes are because these were the characters–as Mr. Crook said, dramatic license was taken.